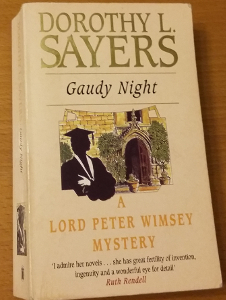 I’m not sure I should admit this, given the company I often keep at writerly events, but… Gaudy Night is the first of Dorothy L Sayers’s Lord Peter Wimsey Mysteries I have ever read! I’ve been aware of his importance in the canon of literary detectives, and have occasionally heard part of a radio adaptation on Radio 4, but those adaptations haven’t ever inspired me to get my hands on one of the books. So, how was it? I enjoyed it, and as someone who doesn’t read an awful lot in this genre, there was enough misdirection to keep me guessing until the denouement (and, indeed, to continue to question after Lord Peter had made his announcement). I’ll certainly keep my eye out for other volumes in 2nd hand shops and suchlike, but I’m a while off becoming a raving fan. There’s several reasons for this: firstly, the style. I’m not all that keen on this older style of writing, and would prefer something more concise. I wasn’t sure why the verses at the start of every chapter were there – I could just be showing my ignorance here – they didn’t really seem to relate to the plot, and with so many of them incorporating Latin, they gave the whole book a feel of literary snobbishness; there were also several times (most notable at the start of the book) where many, many characters were introduced by name and then one never encountered them again – appearances too brief even to act as misdirection. Again, as I said, it’s an older style of writing to that which I normally favour, and to be honest, I might well have taken far more quickly to the book 25 years ago, when I was at the height of my Tolkein-loving phase. And you know what? If I had read it then, I might have been less dismissive of the idea of applying to Oxbridge when I got to sixth form… so who knows what might have happened? Anyway, back to this leg of the trousers of time… I think the biggest issue for me was that this volume appears to fit somewhere in the middle of the series of Lord Peter Wimsey books, and I just didn’t warm to Harriet Vane as a character. Or at least, not until the very end. I think if I had read earlier instalments of her relationship with Lord Peter, I might have been more sympathetic. As it was, she rather annoyed me and then I got annoyed at myself for feeling like that. I recently watched the TV series Good Girls Revolt, about women in early 1970s USA seeking equal opportunity of employment. It was startlingly eye-opening for me to see how far we have come since then in viewing gender as irrelevant to a person’s abilities. I know we still have further to go, but the time difference between that era and now is similar to between then and the setting of Gaudy Night (which is set in 1935), and there are similarly startling differences in attitude about what women can – and, more importantly, should – do in their lives.